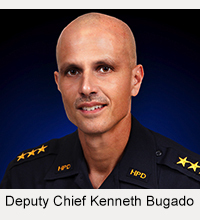 The Kona Crime Prevention Committee recognized Kona Patrol Officer Brad Resureccion as “Officer of the Month” for June in a luncheon ceremony on Wednesday (June 6) at Huggo’s restaurant in Kailua-Kona. 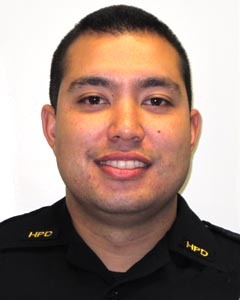 Resureccion—who joined the Hawaiʻi Police Department as a police recruit in February 2011—was honored for capturing a burglary suspect shortly after the crime and obtaining enough evidence to charge him with two offenses. 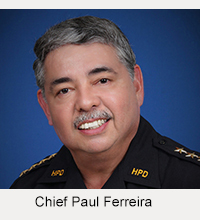 In April, Resureccion was one of several officers dispatched to a residential burglary in progress on Aloha Kona Drive in Kailua-Kona. When he arrived, he learned that the suspect had fled on foot with stolen items. After he and other officers set up a perimeter in the area and began conducting neighborhood checks, Resureccion located the suspect and later recovered the stolen goods. He investigated further until he was able to charge the suspect with burglary and theft. Lieutenant Jeremie Evangelista, who nominated Resureccion for the distinction, noted that the honored officer had first been assigned to solo patrol duties only last November, after completing field training with an experienced officer.